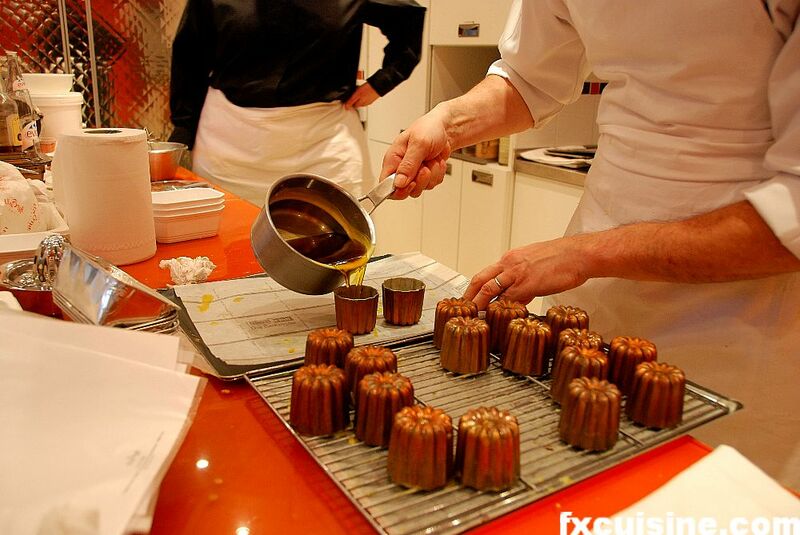 Cannelés Bordelais are humble French little cakes from Gironde/Bordeaux which very few pastry chefs manage to get right. In essence, it is a vamped-up crepe batter cooked in tiny copper molds until they become brown and crusty outside. The inside has to remain wet. A very nice contrast. After a few hours, the crust becomes less crisp because of the humidity inside, so they're best eated straight off the oven. In St-Emilion, the few shops that don't sell wine-related goods all sell cannelés (pronounced [kah-nuh-leh]. 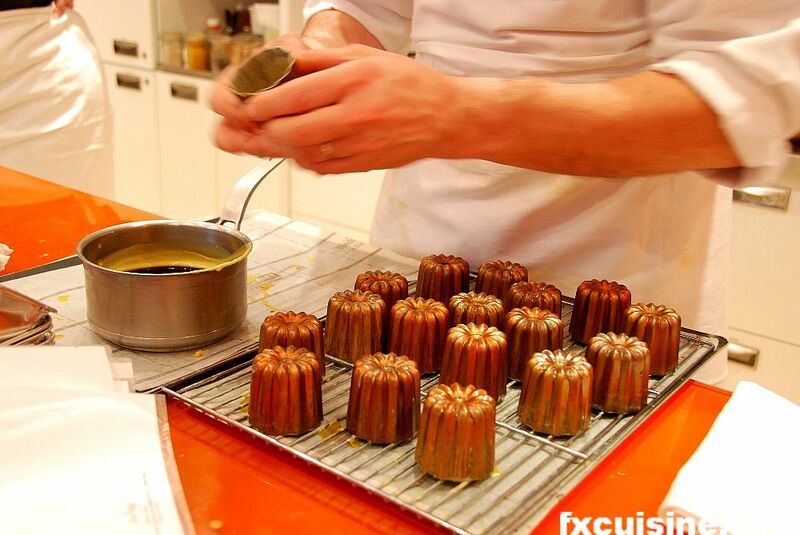 Such is my love for this pastry, I used to buy a cannelé in every pastry shop in Paris. The best was in Fauchon back when Pierre Hermé was their pastry chef. One day, the wife of a pastry chef-owner in the Marais told me these were especially hard to make and that 'We ruined several batches before we managed to cook them right'. If you don't have bitter almonds, chef Schmitt recommended we substitute with apricot stones blanched for 2 minutes. Sounds rather toxic, but hey, that's for a recipe that calls for beeswax. Heat the milk, butter, sliced and grated vanilla pod, lemon zest and almonds. Bring to a boil, then let stand for 1 hour. 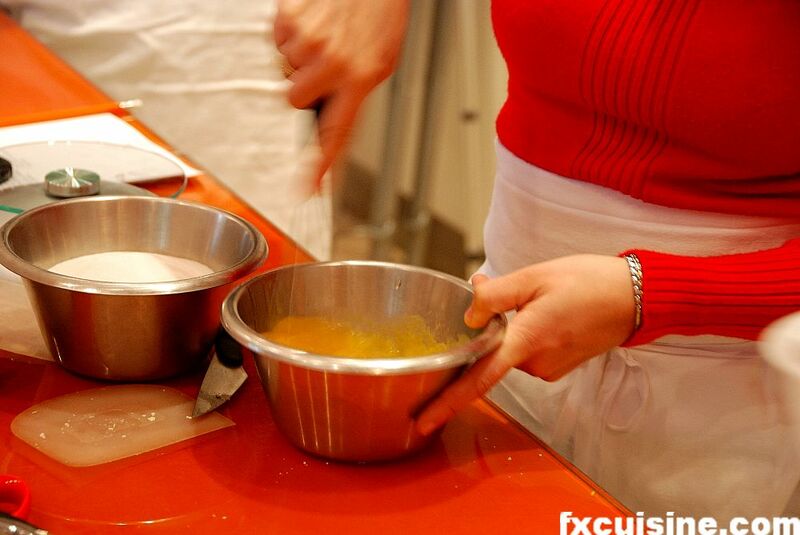 Beat together the egg yolks and whole eggs, sugar and rhum. Don't foam, just mix thoroughly. Add the flour and milk and mix well. The batter needs to rest for 24 hours in the fridge. 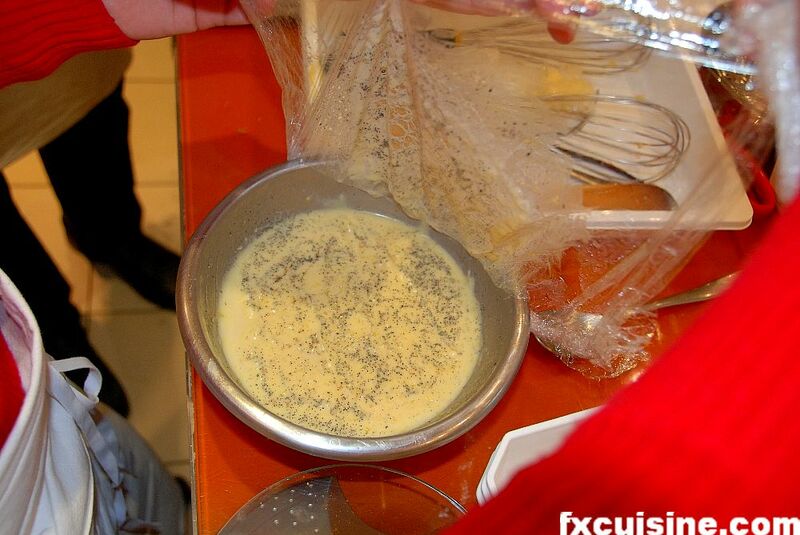 To make it fit in a 3-hour-long pastry class, chef Schmidt prepared a batch the day before and left it in the fridge covered with heat resistant foil put directly on the batter surface (picture). That's the batter we used. 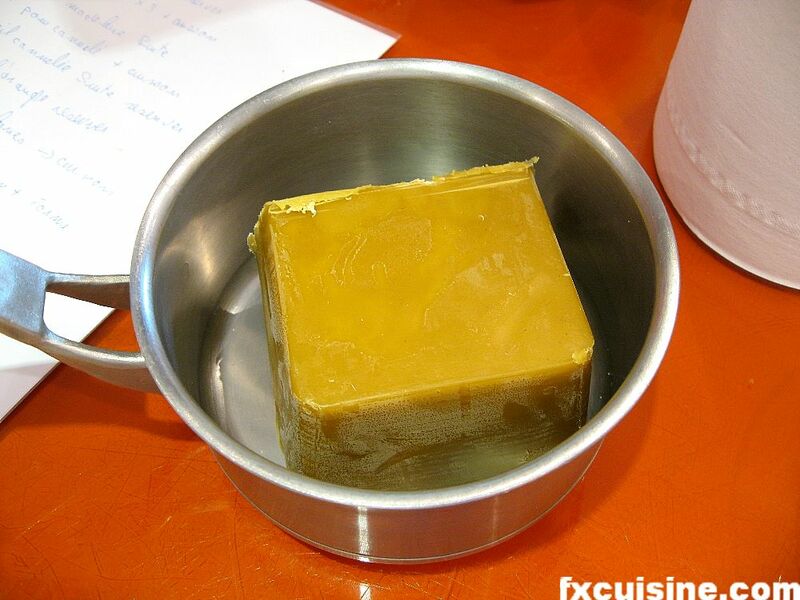 Melt the beeswax in a saucepan. The traditional recipe uses real beeswax, like the one in premium candles. It doesn't burn like sugar and butter would and give a nice crispy brown crust. 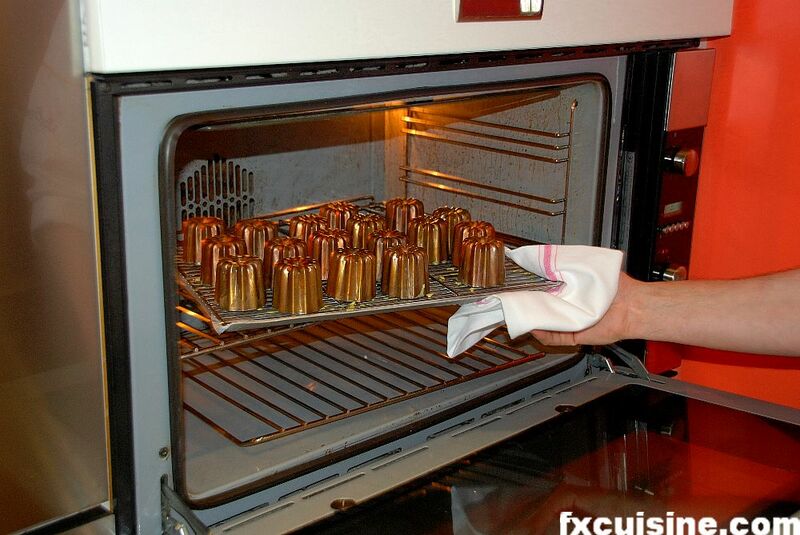 The fluted cannelé molds are put in the oven for 5 minutes. 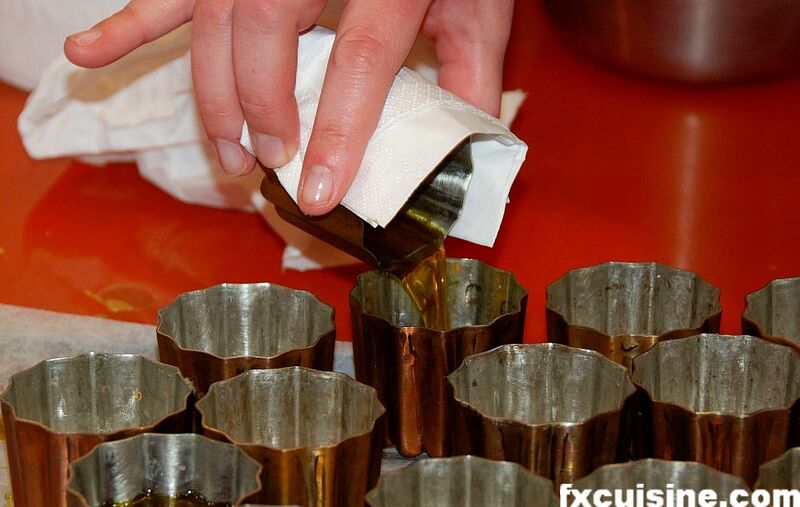 Melted bee wax is poured in the hot molds to coat the inside evenly with a thin layer of wax. Excess wax is then poured in other pans until all of them are coated. If the wax layer is too thick, you may need to put them back in the oven for a minute, then let them drip upside down on a grate.